Today I have a delightful Collection of Vintage Winter Graphics! The images below are curated from Cards, Postcards, and Advertising Cards. Most of the cards feature a wonderful Winter Landscape Scene with snow. I especially love the grand Tudor houses, small cottages, and cabins. So nice to use in your Winter Craft, Junk Journal, or Mixed Media Projects! 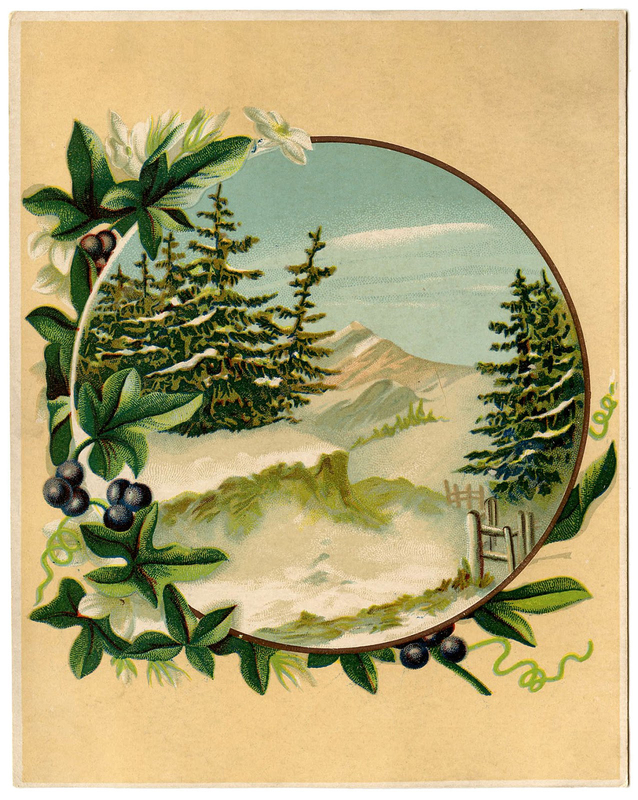 Above is a nice Old Card showing a Winter Landscape! I’m not sure how it’s possible that those blue Flowers are blooming with all that Snow around, but it sure is pretty! I think it would be fun to add some white glitter to this one. Here we have an enchanting Winter Tudor Cottage Image!! 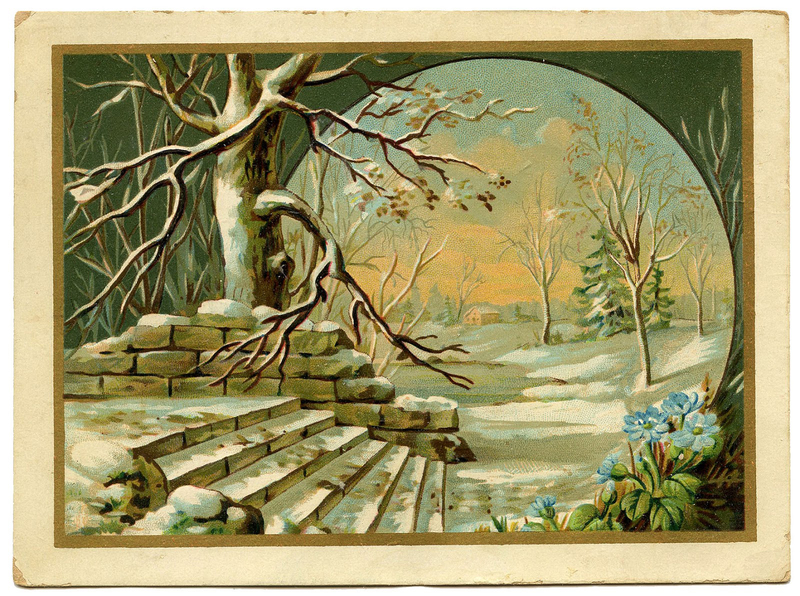 This is an old Tulip Soap Advertising Card featuring a splendid Winter Landscape Scene. The Scene shows a cozy Tudor Cottage with a frozen Pond in front! 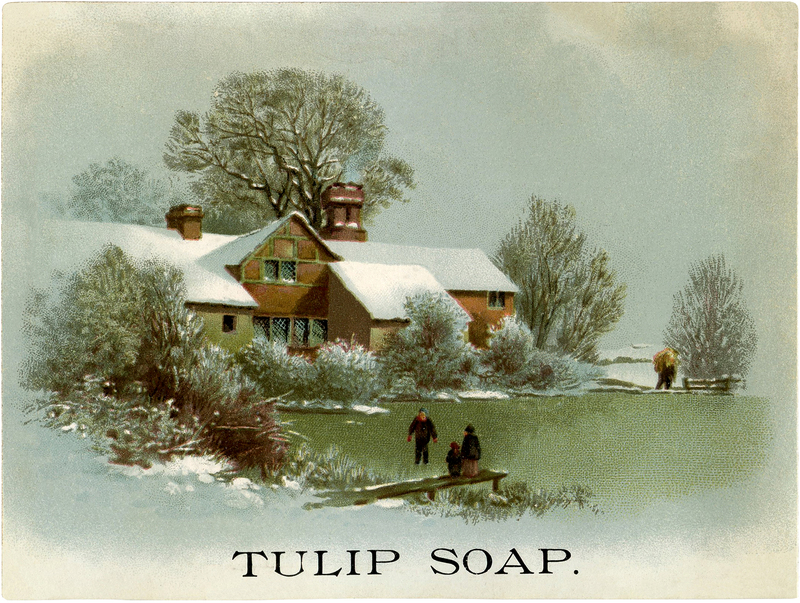 Isn’t this a lovely Vintage Tudor Cottage Winter Image of an old Tulip Soap Advertising Card featuring a perfect Winter Landscape Scene! I removed the wording on this one. The Scene shows a cozy Tudor Cottage with smoke coming out of the chimney! The frozen pond for ice skating brings back childhood memories. 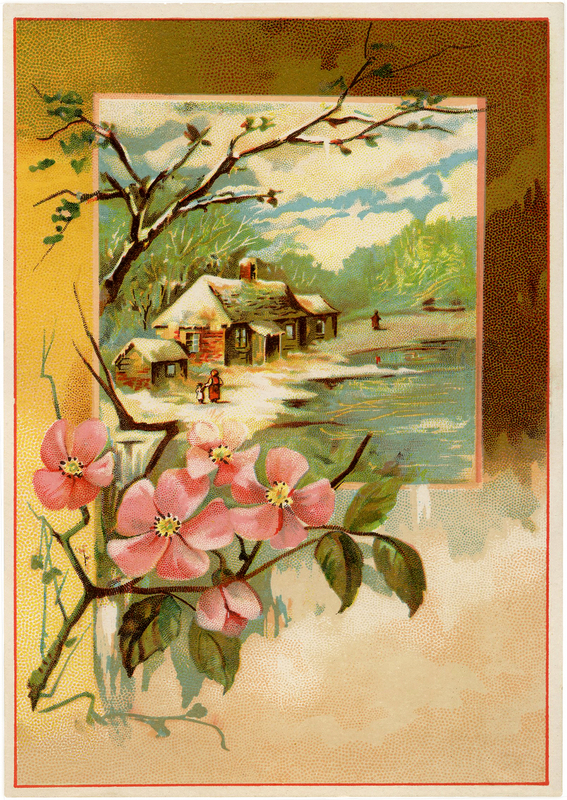 This card shows an enticing Winter Scene with Roses! Shown here is a Winter Landscape Scene with some beautiful Pink Roses and a great Wooden Stick Frame! I love the vintage romantic feel to it! Here we see a lovely Old Image showing a Winter Mountain Scene. Shown are some colorful Pine Trees with Snow on the branches and some attractive Vines with Blueberries! 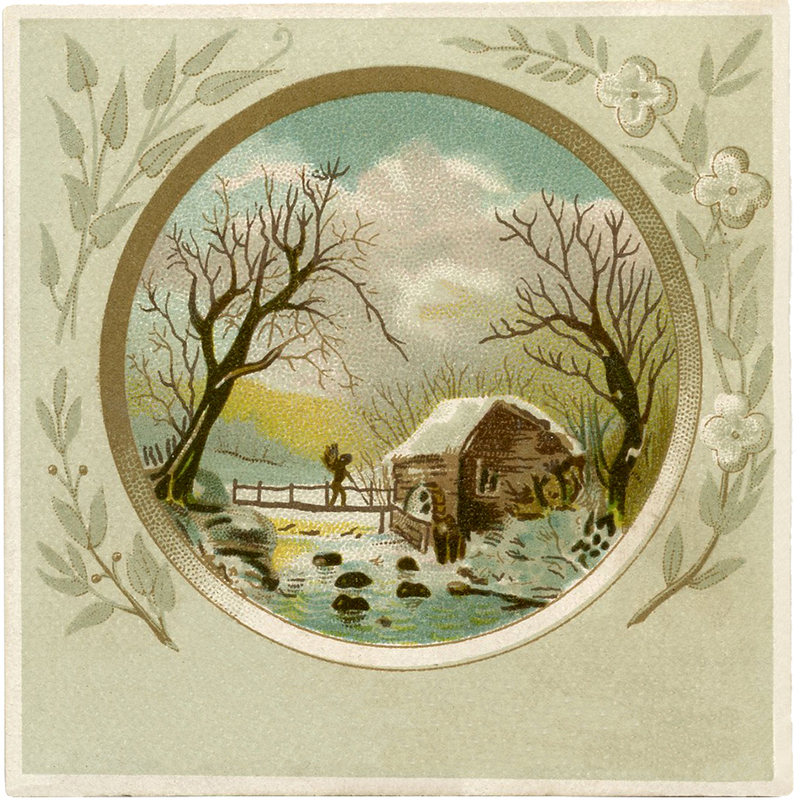 Shown here is a picturesque Vintage Winter Cabin Image! It is a Winter Landscape Scene with some bright Pink Roses and a cute Cabin! This one has such a soft romantic feel to it! 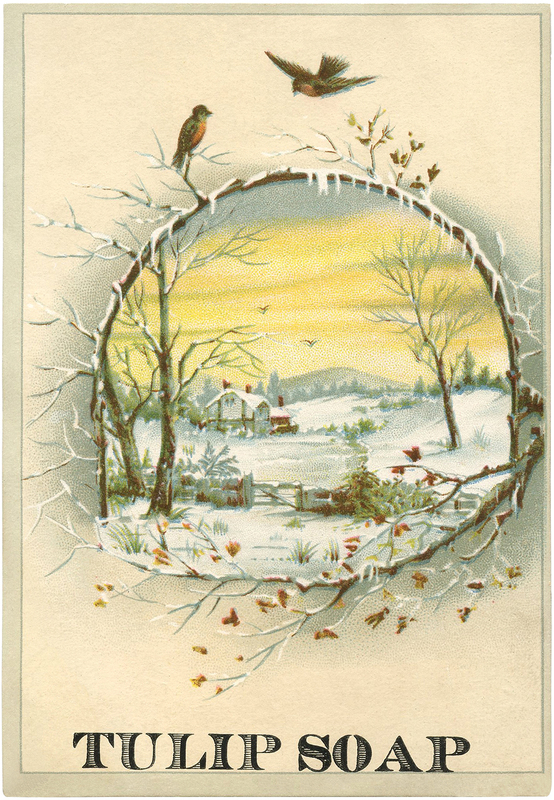 This is a wonderful Vintage Winter Landscape Image!! Shown above is a charming Winter Scene of people Ice Skating on a Pond. The scene is framed with a nice gray Frame that’s embellished with Cattails and Dragonflies! Shown above is another charming Winter Landscape of a little Log Cabin next to a stream. The scene is framed with a round gray Frame that is embellished with leaves and Flowers! 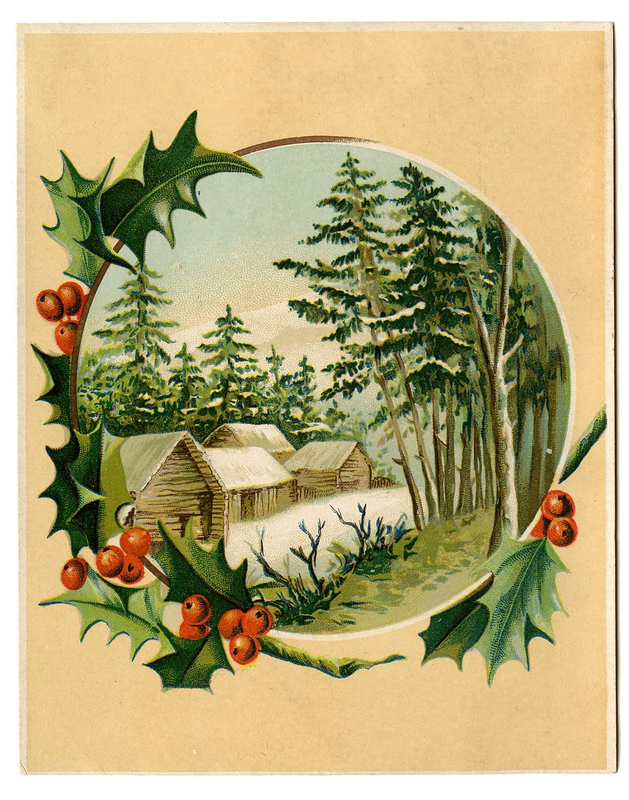 I am fond of this dear Victorian Christmas card showing a Winter scene of a Log Cabin surrounded by tall Pine trees. The landscape is inside a wonderful Holly frame! I’ve separated the frame out for you. 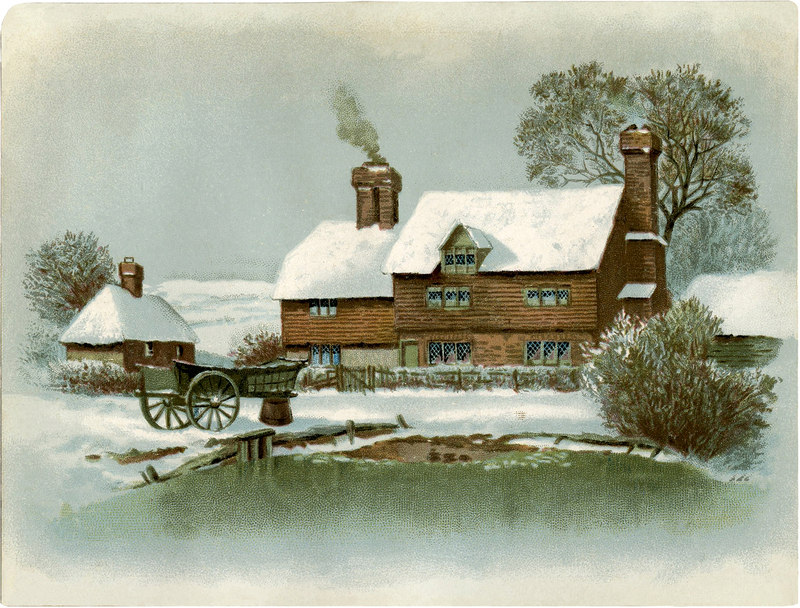 This is a fabulous Winter Cottage Scene Image! 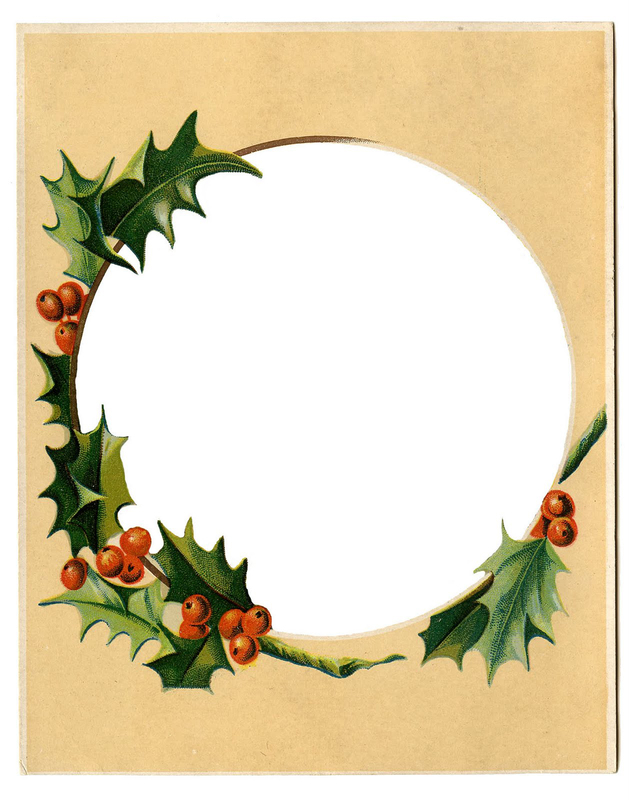 The Antique card was probably used as an old Trade Card, although it doesn’t have any advertising on it. 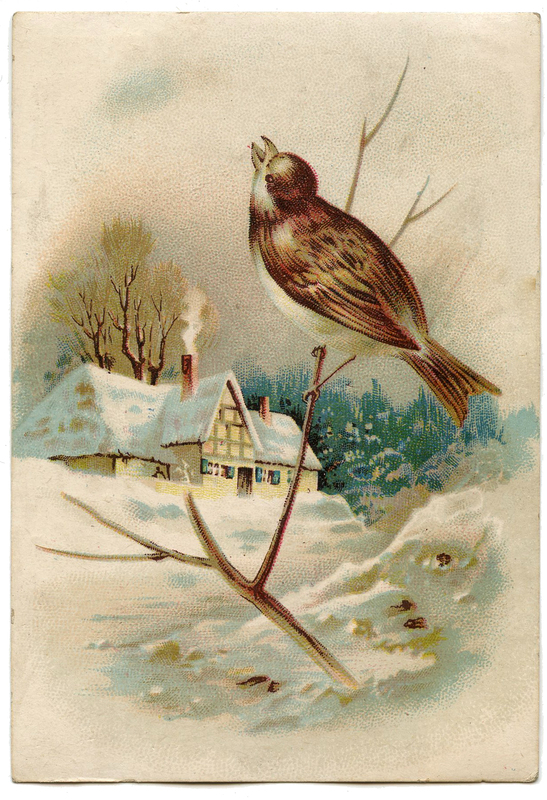 The card shows a charming scene of a cozy Snow covered Cottage with a pretty Bird perched nearby. Such a quaint looking card! Above is a splendid Winter Scene Download! 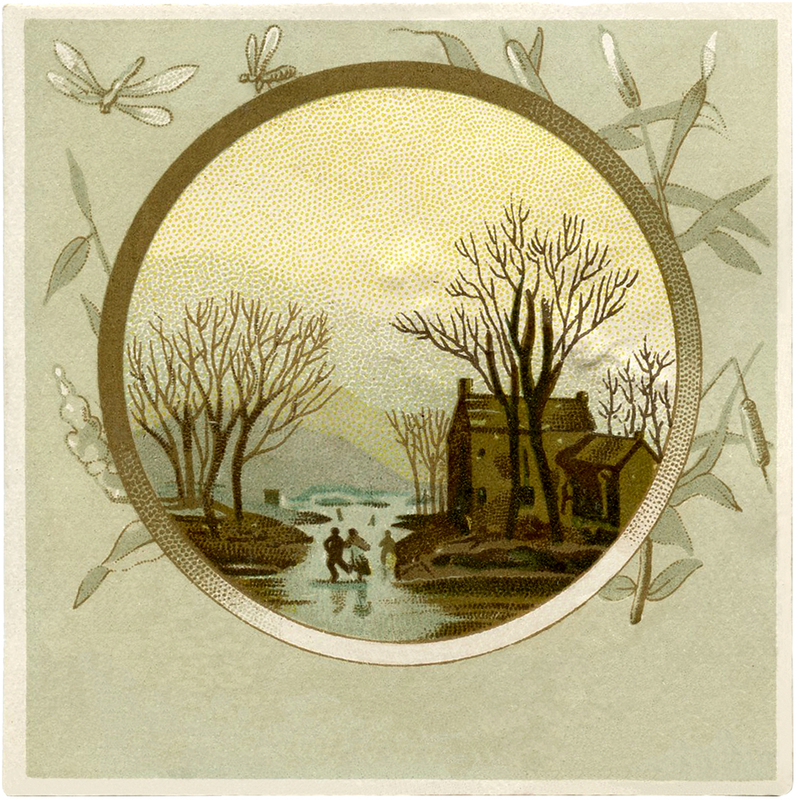 It is an old Tulip Soap Advertising Card featuring a beautiful Winter Landscape Scene. The Scene is framed with Snowy Tree branches and some sweet Birds! 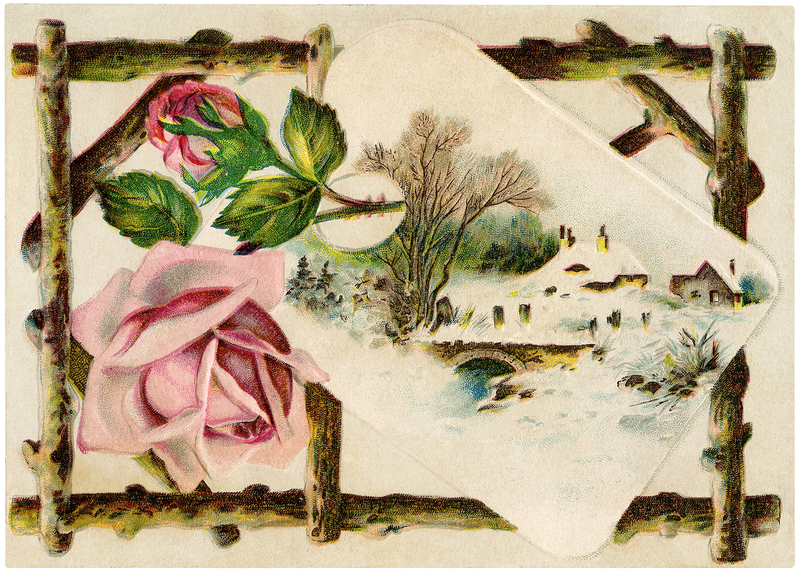 I hope you enjoyed this curated collection of 12 Delightful Vintage Winter Graphics. You might also like our Best Snowman Images HERE! Abstract Winter Acrylics Images Kit! Graphics Fairy Premium Membership Lovely Vintage Countryside Stone Cottage Image! Charming Vintage Farming Landscape Image! This is beautiful – love those rather incongruous blue flowers :-). That definately is a primrose. I’ve had them in many colors and they do bloom early so snow is often around them. Thanks for the info on the Primrose Ms. Peppercorn! Now, I was going to say those were Hellebore plants flowering in the snow. But Ms Peppercorn may be right about them being Primrose. Either way, it’s a beautiful picture. Thank you. That winter landscape is so pretty, gives hope for Spring with the primroses. I cheated, read above comments to know what the flowers are. Thanks so much for beautiful graphics. All of these have special elements with winter landscaping, beautiful homes, lovely nature — all of these are so pretty! They all have that warm, cozy, fireplace feeling that goes well with a glass of wine or hot cocoa. It’s so fitting on this cold, wintry evening.